Is a cartoon Dinosaur seeing yourself on the big screen? 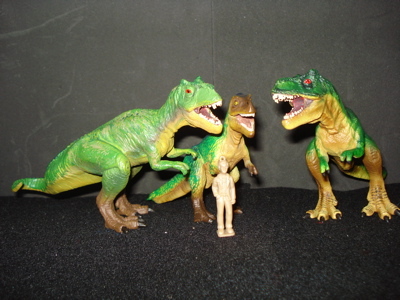 The November 28, 2009 "Tyrannosaurus Wrecks" blog entry. The November 29, 2009 "Tyrannosaurus Wreaks" blog entry. Today our star is the fated for stardom 2006- Wild Safari Tyrannosaurus Rex. Costarring is the 2005 Safari Juvenile Tyrannosaurus. As such things go an inspired if uninspiring predecessor. 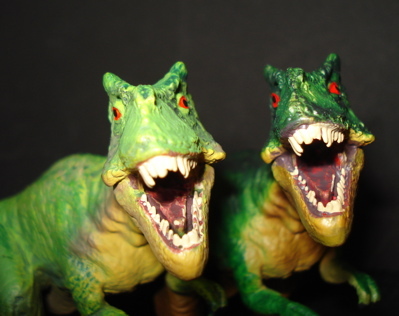 The 2006 T-Rex is the first in a whole new direction for what had been Safari's dedicated Dinosaur toys line with The Carnegie Collection being their "museum quality" line. With this excellent figure they have reversed the roles and have since introduced five more (to my knowledge, and that's as knowledgeable as it gets) superlative figures- an Allosaurus, a Stegosaurus, Triceratops and Velociraptor (2007) and a Dilophosaurus (2008). Each even better than the T-Rex! Yes. It is hard to believe. 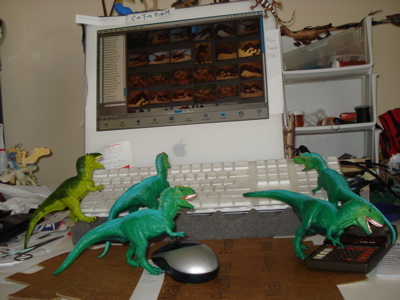 So our very contemporary Tyrannosaurs are trying to figure out how, if they can't beat 'em, they can eat 'em. 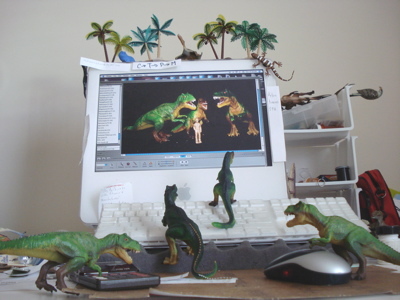 (Will Dinosaur toys jealousy never end?) Tomorrow... something else. "Wow! What a great looking app!!"